CARLOW made it four wins from four in this national football league Division 4 tie at Carriganore, Waterford on Saturday. The margin of victory at the end flattered the home side but the concession of two goals in the final minutes had Carlow hearts palpitating. It should never have come to this. It would have been a travesty if Waterford had somehow managed to find the net for a winner. This was a lesson learned for Carlow. In boxing terms, the Barrowsiders had their opponents on the ropes for most of the game but somehow they almost managed to let them wriggle free and land a knock-out blow. So much for the negatives. On the other hand there were any amount of positives to take from this as selector Benji O’Brien stated after the final whistle. With the wind in their tails it was a point from JJ Hutchinson which nudged the home side in front. Carlow hit back with Paul Broderick giving a sign of what was to come when knocking over a point from play. Waterford replied with further scores from James McGrath and Jason Curry. Carlow grew into the game as their patient build-ups reaped dividends into the wind. Two identical frees from Broderick levelled as Carlow produced a goal chance when Darragh Foley’s excellent cross-field pass found Eoghan Ruth. The Éire Óg man worked himself towards the goal but shot tamely wide. If Carlow were disappointed it didn’t show as Broderick landed a free after Sean Murphy was fouled. The scorer was then felled himself and once more he converted the resultant free. Waterford had Kieran Power black-carded for an off-the-ball foul on Brendan Murphy on 25 minutes. Shortly after that, Carlow worked their way in for a goal with Sean Gannon scoring from close range. That was huge in the context of the game as the visitors went into the break leading 1-8 to 0-5. “We knew at half-time this was far from over. It turned out that way,” said Benji O’Brien. Waterford sent out early second-half warnings but five wides in 10 minutes undid much of their good work. On the other hand, Darragh Foley converted a free and then Sean Gannon got in the way of a Waterford passing movement. 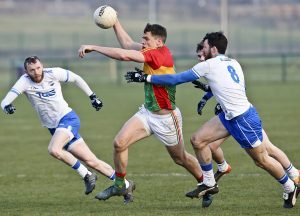 The ball was moved through the hands with Paul Broderick feeding Darragh O’Brien who in turn off-loaded to Daniel St Ledger for Carlow’s second three-pointer. That should have been it, especially as Carlow continued to create chances. At times it looked as if over-confidence was their enemy when point chances were not taken. Instead the visitors tried to go for the jugular and goals. Intended passes were intercepted or not delivered accurately enough. Waterford persisted with Jason Curry, Hutchinson and Paul Whyte all pointing. Another home move saw Brendan Murphy concede a penalty when the ball carrier dipped and went inside him. There were questions asked afterwards whether the foul took place inside the big square but after what seemed an age, referee Brendan Cawley signalled for the penalty. Gavin Crotty buried the kick and Waterford had a life-line. Carlow then retreated into their shell. In an effort to play down the clock they threw the ball around among themselves close to their own goal. They lived dangerously and with the game deep in injury time they lost possession. Shane Ryan swooped and Paul Whyte boxed home a pass from the centre-back. With the refereeing signalling that there was still time left to play, the unthinkable was on. Carlow pulled themselves together and put a move together which saw Brendan Murphy drive forward. This time Carlow were happy to see him shoot over and with that the final whistle went. Afterwards Benji O’Brien talked about the challenges of life in Division 4 of the league. “In every other division, the first goal is to get a couple of wins to stay up. In this one, there is only one prize and that is to get out of it. Every game is a must-win game. Carlow: Robbie Molloy; Danny Moran, Shane Redmond, Conor Lawlor; Jordan Morrissey, Daniel St Ledger (1-0), Ciaran Moran (0-1); Brendan Murphy (0-1), Sean Murphy (0-1); Sean Gannon (1-0), Darragh Foley (0-2, 0-1 free), Eoghan Ruth; Paul Broderick (0-6, 0-4 frees), Darragh O’Brien, John Murphy. Subs: Mark Rennick for S Murphy (h/t), Kieran Nolan for Morrissey (46 mins), Diarmuid Walshe (0-1f) for Broderick (53 mins), Lee Walker for Foley (60 mins), Chris Crowley for Redmond (60 mins), Liam Roberts for D Moran (67 mins). Waterford: Stephen Enright; Brian Looby, Thomas O’Gorman, Aidan Trihy; James McGrath (0-1), Shane Ryan, Michael Curry; Tommy Prendergast, Kieran Power; Conor Murray, Joe Veale, Dylan Guiry; Jason Curry (0-2 frees), JJ Hutchinson (0-3, 0-1 free), Paul Whyte (1-1). Subs: Gavin Crotty (1-2, 1-0 pen) for Power (black card 25 mins), Jack Mullaney for Trihy (h/t), Conor McCarthy for Guiry (49 mins), Joe Allen for Curry (46 mins), Martin Scurry for Prendergast (46 mins), Eoin O’Brien for Veale (61 mins).